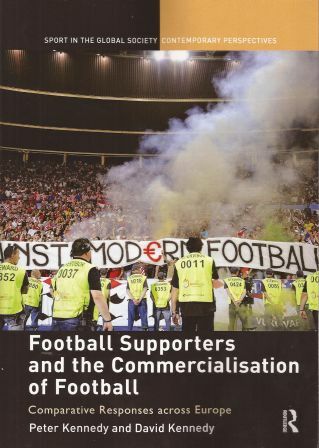 The main purpose of this book is to describe and analyse supporters’ reactions to the commercialisation of football in Europe. The book uses the word “commodification” to describe how football clubs have become a commodity. Fans are seen as the one constant in a world of changes of ownership, manager and stadium at clubs. The theme is analysed in 8 chapters from the perspective of different clubs and countries. Richard Giulianotti’s four categories of fan: supporter, follower, fan, flaneur is used to understand fans. A case study of a plan to relocate the Everton FC stadium highlights the tension between traditionalists and fans defined by a market led altitude as between the concept of a community club and a business model. Another chapter explores the issue of foreign ownership with reference to Liverpool FC and the “clueless yanks” in particular the challenge of maintaining “authentic forms of local cultural practice and identity formation around football in the face of sometimes grim realities of globalization and foreign ownership”. With some irony the chapter notes that when Liverpool FC was at the very height of its football powers in the late 1970s - double European champions and also Football League Champions - they were in the words of chairman, John Smith “very successful in football terms but in economic terms we are broke”. In contrast the American owners are accused of pushing a business model with a lack of understanding of local sensibilities. A chapter on Spain, based on interviews with 19 fans, six sports journalists and three professional managers, concludes with the paradox that fans’ fascination with football coexists with the feeling that the clubs are poorly managed and economically unsustainable. The chapter which chronicles the process of football’s commodification in Israel, concludes that it has had a critical impact on the fans. There is also an assessment of Supporters Direct, an initiative of the British government in 2000. A book on the commercialisation of football through the eyes and experiences of fans is a welcome addition to the literature. One cautionary note: while the book was published in 2017, it is a re-publication of a 2013 book. The reference to Franz Beckenbauer as “football’s ultimate moral authority in Germany” is rather ironic in view of recent developments.